No, this journey has religious significance. It all started out when Red obtained the Helix Fossil early on in the game, and from there, it has exploded. Basically, the TPP’ers worship the Helix Fossil in this mock religion. Part of this is due to the fact that during battle, Red will often time be forced into the menu by trolls, or he’ll randomly check his bag at points in the game. This is known as “Consulting Lord Helix.” What should one do in battle? 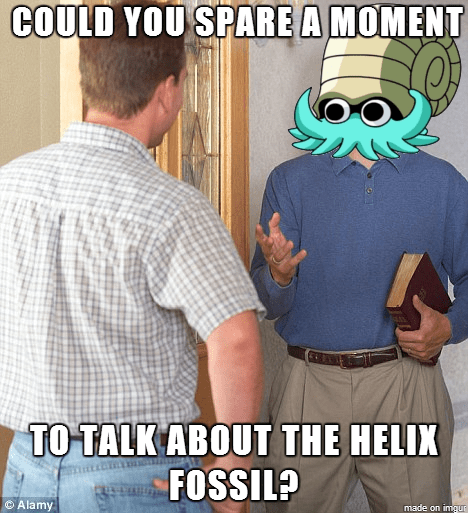 Always consult Helix, for Helix knows all! You get the point, I’m sure. In fact, this gives rise to something greater. Red’s journey is not about beating the Elite Four. No; his true mission is to revive Lord Helix by ressurecting Omanyte. This is “official stuff.” This Google Doc shows the official progress of the TPP stream, as noted by a faithful follower. Along with the factual items such as “Got The Lift Key” and “Completed Safari Zone,” there is one achievement written in gold letters: “Revived Lord Helix.” The TPP’ers take their religion seriously. Every god sends prophets, right? Helix is no different. His prophet comes in the form of a Pidgeot, which the community refers to as Bird Jesus. The reason being that he nearly single-handedly defeated an entire gym full of trainers using Gust and Sand-Attack. But, things couldn’t be perfect for long. Naturally, since Red could have chosen between the Helix Fossil or the Dome Fossil, the Dome Fossil is seen as a devil of sorts, since Helix is the deity. Of course, the devil in the story would send temptations, right? Enter Eevee. At this point, the TPP’ers needed a Pokemon that they could teach Surf; their main options were to obtain either an Eevee or Lapras, but they opted for Eevee. As you probably know, Eevees are coveted in Pokemon because given the right item, they can evolve into virtually any form you want. Umbreon is a dark evolution, Jolteon is an electric evolution, and so on. Each one can learn moves specific to their own type, so the TPP community decided that Eevee should be evolved into a water type Pokemon. Then they could teach it Surf, which is one of the most important HMs in the game. What ended up happening? They went into a store to buy a Water Stone, but things turned disastrously bad. They ended up buying a Fire Stoen due to trolls, and Eevee became a Flareon: fire type. In an outrage, the community labeled him The False Prophet sent by the evil Dome to tempt Red. He was blamed for the team’s recent troubles. For example, not long before The False Prophet entered the picture, two of their best Pokemon had been accidentally released when they went to the PC. These Pokemon, named Abby (nicknamed ABBBBBBK ( upon capture, thus called Abby) and Jay Leno (nicknamed JLVWNOOOO upon capture) were very important allies, and upon their release, the community was crushed. Of course, then Flareon came into play, and it all made sense: The False Prophet had brought a curse upon their party. Eventually, Red went to another PC where he picked up a Drowzee they had caught earlier. In the process, The False Prophet was released. The community was overjoyed, and they named Drowzee “The Keeper,” and they vowed to keep him for his sacrifice. By joining the party, he extinguished the threat of The False Prophet. They could now continue without fear. After that, Lord Helix was resurrected in the form of Omanyte, their supreme team headed on to defeat the rest of the gym leaders, and all was well in the Pokemon world. But when you think about it, this “religion” that was created was no small feat. I haven’t described all the lore that goes into it, but a quick search for “Twitch Plays Pokemon,” “Lord Helix,” or other similar search terms will turn up a lot more info if you’re interested. There is no question that the lore is quite amazing, and it’s definitely a feat. For example, all participants collectively agree upon names given to each Pokemon, such as “The Keeper,” “The False Prophet,” and others. Everyone refers to these Pokemon by their “official names.” The names of the current party Pokemon? First of all, let me point out that these nicknames are very creative. Although their nicknames (if they have one) are due to the fact that actually nicknaming a Pokemon is so difficult with all the button inputs, their nicknames in the lore are amazing. Calling AAAAAAAAAA The Fonz since that’s what he says in the TV show Happy Days is absolutely genius! My personal favorite is probably AIIIIIIRRR becoming Air Jordan; love it! But more astounding than that is that everyone agrees on these names. I don’t see anyone referring to the Pokemon as anything other than their nicknames in the lore. Having thousands of people agree on names for all these Pokemon is really a miracle. Keeping the lore together (and creating it, really) is also a miracle. It’s so well documented, and all the sources I’m seeing are keeping the story straight. This religion, lore, and the nicknames are well documented for eternity. On top of that, you see all these comics, memes, and pictures I’ve included in this post. All of these (and countless others) have sprang up over the past couple of weeks due to this cultural phenomenon. Heck, on February 16th, Twitch Plays Pokemon was the 7th most searched term for the day. Twitch’s Wikipedia page already has the TPP stream officially documented as a viral phenomenon in which Twitch Vice President of Marketing Matthew DiPietro praised the stream, considering it “one more example of how video games have become a platform for entertainment and creativity that extends WAY beyond the original intent of the game creator.” In fact, Twitch Plays Pokemon has its own Wikipedia page already as well! Let it be known that this isn’t just some weird Twitch stream. This is something more. This is an event that will go down in history. We’ll tell our kids about the stream, and maybe there will even be documentaries on it. Am I exaggerating for the sake of making a post? Not in the least bit; I truly believe that we’ll see far reaching effects from this quirky stream, and it will not easily be forgotten. After all, the stream has about 33 million views at the time of writing; I don’t think that will easily be dismissed as a mere footnote. What do you think? Am I overthinking things, or is this truly a phenomenon that will be remembered in video game history? Comment below, and I hope you’ve enjoyed this article, and the stream, since it’s coming to an end. Hit the like or follow buttons if you’ve enjoyed, and maybe check out the LP channels in my “Links” tab. This is where I’m going to say that Matt, honestly, I wish you the best in your desire to get your foot in the door and do something meaningful within the video game industry. The industry is in a very bad place and, of all the people it can use, it needs younger people like yourself who have a good head on their shoulders and recognise there are a number of needless problems threatening to tear it down. I suppose that’s a goodbye then? In the whole ‘trollolol, wutevr ur upinion iz only a upinion’ and ‘no1 cares bro’ I still can’t help but be me. I’ve always been critical of what you do, in respect to both mechanics and ideas, and this criticism has been both positive and negative. (Criticism, after all, isn’t to be considered a negative opinion but instead careful analysis.) For a while now I’ve found more negative things to point out than positive, along with you not really acting on solid criticism that wasn’t simply two strong but different points-of-view meeting. At this point I don’t think I can say much more than I’ve already said. I really do wish you the best and hope that you are able to fix the problem areas I’ve mentioned throughout my experience with your blog.